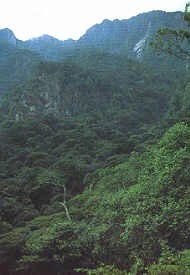 Rainforest in the Usambara Mountains in Tanzania. Photo: Svein T. Båtvik. In the 18th century the pupils of Linnaeus travelled to discover the world. They collected plants and animals from the far corners of the world. This was a time when many new species were described, not least by Linnaeus. In total 20 000 species were known to science at that time, today we know about 1 413 000 species of all kinds of organisms. Is there anything left to discover? The fact is that the scientists of today describe new species all the time. Most new species are found in the tropics. Many are already known to the local people but not to science and they lack scientific names. In other areas it is also possible to find new species, but then in less investigated groups of organisms, for instance fungi. If you want to know more about a country with 400 species new to science click here.